Dansko’s Professional clog helped introduce Americans to Euro comfort and change the lives of millions of professionals along the way. Dansko, whose name translates to “Danish Shoe,” has benefited greatly from the sharing mentality. Cabot credits much of the initial success of the Professional clog, which they introduced to America in 1990, to the strong word of mouth recommendation the style received. “Our friends fell in love with the Professional, so they told their friends. And then their friends told their friends,” Cabot says. “Before we knew it, we had begun selling the clogs at horse shows, right out of the back of our station wagon.” Cabot soon spotted the clogs being worn outside of the local barns on dog walks, while traveling and hanging out with friends. She attributes the crossover appeal to the clog’s versatility and comfort. It just works really well as an everyday shoe. “Comfort, support, ease of wear and versatility are the four most frequently lauded attributes,” Cabot says. While the CEO admits that the comfort features are somewhat hidden and unconventional, the shoe’s “firm and somewhat elevated platform, broad and rigid heel counter, generous fit, and rocker bottom” are the keys to what she describes as its exceptional ride. The Professional, in fact, wears the American Podiatric Medical Association (APMA) seal of approval, which is granted to products that promote good foot health as determined by the association’s podiatrists. 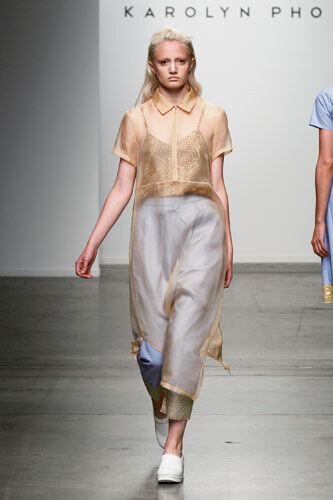 White hot: Dansko’s Professional takes center stage during Karolyn Pho’s homage to ’90s fashion Spring ‘15 show. “The Professional style is iconic because it has a unique construction that is extremely supportive under the foot, making it comfortable and giving all-day support,” agrees Ed Habre, president and CEO of The Shoe Mill, a comfort chain based in Portland, OR, and one of Dansko’s original retail partners. In addition to its proven comfort benefits, retailers cite variety as a main factor behind the Professional’s long-running appeal. Season after season the style has undergone numerous color, material and pattern updates that give the closet staple a fresh take for loyal wearers, as well as whet the appetite of new customers. Indeed, the style has boasted more than 1,000 different upper iterations, from hair calf to patchwork leather, felt to boiled wool, even neon bubbles to a zoo full of animal print patent leathers. The outsole has also seen different dressings, such as wood grain stains and braided jute. The updates on the classic, reports Dave Bailey, co-founder of Danform Shoes based in western Vermont, is what has kept his customers coming back year after year for their next Professional clog fix. “The comfort is the starting point and then [the consumers] talk about the colors,” he says. “The customer is basically buying the same great shoe, just with different upper materials.” Bailey adds that this formula assures that customers get the same high-quality clogs they know and trust, but it also provides incentive to buy several different styles—often within the same season. “So many different upper materials allow consumers to boldly express their individuality,” Cabot says. Sales of the Professional grew steadily over the first few years and took off when it caught on with people working in the healthcare, restaurant and education fields. Many of these professionals cite, in particular, its incredible support that allows them to stand comfortably for extended periods of time. Cabot notes that from the brand’s second year onward, consumers began asking for similar comfort in other silhouettes, and it wasn’t too long after their launch that the couple set aside their equestrian business and became full-time shoe people. The Professional has served as the cornerstone to what was once affectionately referred to as “the little clog company” and now is a full-fledged footwear brand sold by thousands of retailers nationwide. 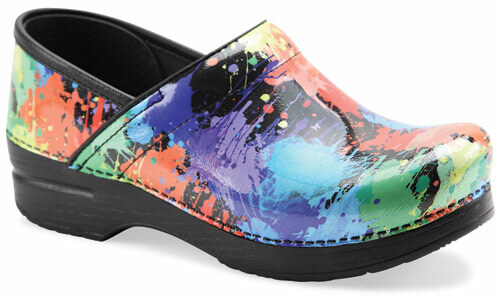 Dansko now extends to boots, sandals, flats, activewear, heels and beyond. It is also a company renowned for its core values regarding environmental conservation, charitable initiatives and employee support. While the Normcore trend that embraces’ 90s-era comfort basics is right in step with the Professional, style experts don’t see the demand decreasing once the next fashion wave comes ashore. And that’s the true test of what makes for an iconic shoe. Fashions may come and go, but these shoes never go completely out of style. They stand the test of time. The Teva Original Universal spawned the sport sandal category and has encouraged wearers to embrace a go-anywhere, do-anything attitude for 30 years and counting. When Mark Thatcher created the first Teva sandal in 1984, he did so out of necessity—there was no such thing as a sport sandal at that time. A rafting guide in the Grand Canyon, he was sick of waterlogged sneakers and guests losing their flip-flops on the river, so he attached a Velcro watchband to a thong sandal and the first sport sandal was designed. After complaints of blisters rolled in, the sandal was modified to go over the toes instead of in-between, a third strap was added along the outside of the foot to connect the toe and ankle straps, and the iconic silhouette of the Original Universal was born—not to mention a new performance sandal footwear market segment that has generated billions in sales over the past three decades. One could argue that without the Original Universal there would be no Air Deschutz sandal by Nike, Chaco or Keen. Deckers Brands has manufactured and distributed the first-ever sport sandal from its beginning in 1986. “The Original Universal was a hit from day one, and literally started on the ground floor, as our first point of distribution was selling out of the trunk of a car to guides and specialty retailers,” says Angel Martinez, president and CEO of Deckers Brands. Martinez confirms that the sandal was an immediate hit with outdoor enthusiasts, but it didn’t take long for them to start showing up on feet at college campuses and on city sidewalks. “The popularity of the style really gained momentum after landing with our first national account, L.L. Bean,” he says. Part of the appeal was the infusion of color and an artistic aspect when the sandal was fitted with patterned jacquard webbings. The brand also started to promote the ideology that still guides them today: “The Original sandal appeals to a mindset—not a demographic,” Martinez asserts. Along those lines, the ads from the early ’90s asked: “Do you exist in shoes or live in Tevas?” and this free spirit, embrace of adventure and the outdoors heritage lives on today. Isack Fadlon, co-owner of Sportie LA, says part of what makes the brand and that particular style so special is the “emotional bond we have with Teva—everyone has a Teva story. All of our staff have their own stories, whether it’s concerts, rafting trips or hiking trips. For me, it was traveling around Europe in my Tevas.” Sportie LA has sold Tevas since the late ’80s and Fadlon says it’s been an anchor brand for the store that keeps customers coming back. Part of that draw is due to the sandal’s versatility that makes it capable for wear in a variety of conditions. “Teva is made so comfortable,” says DeChant, “it is such an all-around great shoe, so you can hike in it, go shopping in it, walk around town in it—and the price point is awesome. Anybody and everybody can wear it—it’s got really broad appeal.” Consumers of all ages sport the style, and it can easily be dressed up or down. 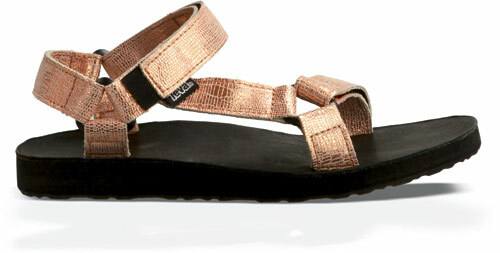 In addition, the numerous color and print options make it easy for wearers to put a personal spin on the sandal. The style does translate beautifully in collaborations, adding yet another dimension to the wide spectrum of options. Embracing the socks and sandals trend, Teva has partnered with Woolrich on a collection of box sets in eye-popping prints and colors that complement the patterned webbing and colorways of the sandals. The collection debuted this fall at select Urban Outfitters stores as well as on teva.com and woolrich.com. To help guide shoppers on how to pull off the #SocksandSandals look, Teva has also teamed with stylists Elizabeth Stewart and Kira Sheppard for tips that can be found on its website. The brand’s openness to collaboration and innovation, its proactive approach to seek new points of relevance, and its long-standing commitment to quality ensure that the Original Universal should keep its toehold in people’s shoe closets in the years ahead. “The Original Universal sandal will continue to evolve with culture and our consumer, but always maintain its iconic style and a sense of freedom every time you strap a pair on,” Martinez promises. 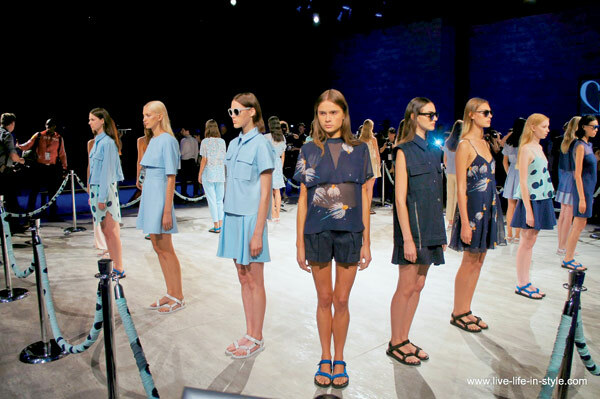 Teva: starring in Samantha Ronson’s recent runway show.